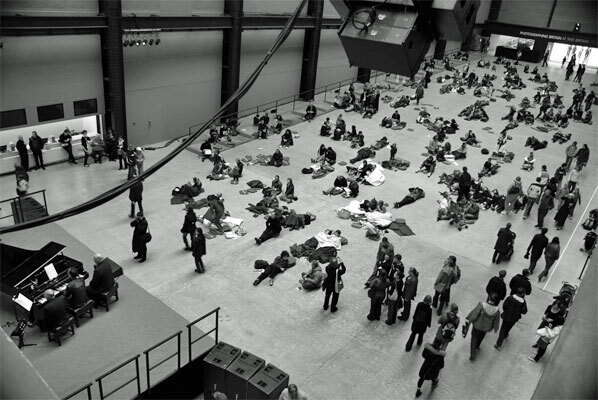 On Sunday, May 27, 2007 the Tate Modern in London showed Andy Warhol's Sleep accompanied by Erik Satie's Vexations from 7:30 pm to 3:00 pm the following day as part of their "Long Weekend" series. Pianists included Gavin Bryars, Michael Nyman, Joshua Rifkin and Tania Chen. The event was introduced with a special performance by John Giorno and a panel discussion was also held which included the writer Branden W Joseph. The blurb for the event claimed that "Warhol was inspired to complete the film [Sleep] with a new repetitive editing structure after attending the writer and composer John Cage’s (1912–92) historic 1963 performance at the Pocket Theatre in New York of the French composer Erik Satie’s (1866–1925) epic repetitive work for piano, Vexations, 1893." (1) In 2008 the claim was repeated by Emma Lavigne, curator at the Pompidou Centre in Paris, who wrote in an essay published in the Warhol Live exhibition catalogue that the impact made by the Vexations concert "was decisive and inspired the artist to the unprecedented, repetitive structure of the film Sleep (1963)." (2) However, there is no documentary evidence that Warhol actually attended the concert or that the concert did indeed "inspire" him to construct his film with a "new" repetitive structure. John Cale, one of the pianists at the 1963 Vexations concert and later a member of the Velvet Underground, managed by Andy Warhol, recalls the circumstances of the concert in his autobiography but does not mention Warhol being there. There is no reason to assume that even if Warhol had been there Cale would have known, but apparently John Cage, himself, was unaware that Warhol attended. Although Cage did not recall Warhol being at Vexations, the writer George Plimpton claimed that Warhol was, indeed, there. According to Plimpton, Warhol told him he had attended "the whole thing." Assuming that Plimpton's recollection of the conversation is accurate, it is unlikely that it took place in the Factory elevator. If it had been the Factory elevator that Plimpton and Warhol were in, the conversation would probably have taken place months after the concert as the Factory did not begin operating until the end of January 1964 and the concert took place in September 1963. 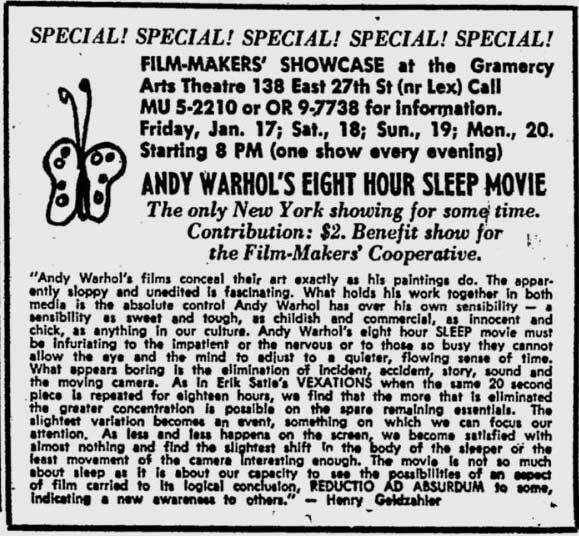 Possibly the earliest suggestion that the Vexations concert influenced the editing of Sleep was in an essay on the film that appeared in the 1994 publication The Films of Andy Warhol, Part II. In that essay it was suggested that "Warhol's use of repetition in the editing of Sleep was probably influenced by the September 1963 performance of Erik Satie's Vexations (1893-95), which he attended at a time when he had shot most of the footage for his film but had not yet begun to edit it. 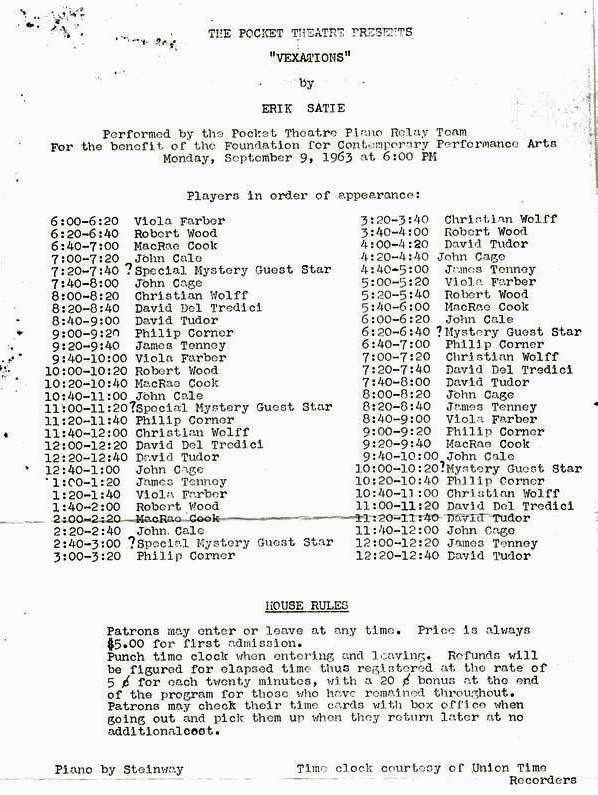 Warhol discussed Satie's use of repetition with John Cage, who was the organizer of the event." (7) The claim is footnoted "Conversation with Billy Name, October 28, 1993." "Here's what I recall about the Cage/Warhol/Satie situation, and it's now become very fragmentary. Andy and I and John Cage in an elevator going up. 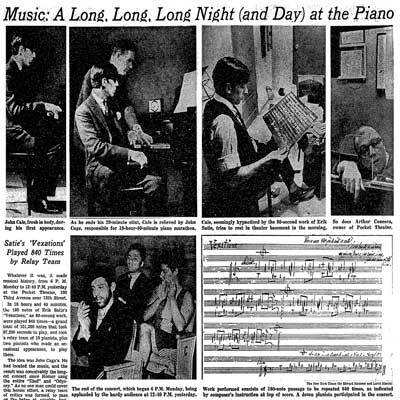 Andy and John Cage talking about the Satie piece in a delightful way and how it reflects the way both of them were working at that time. Andy mentioned his multiples in terms of painting (silk screens). Billy Name does not claim that Cage and Warhol discussed Vexations in relation to Sleep. Name recalled that Warhol brought up his silkscreens in the conversation but nothing about Sleep. 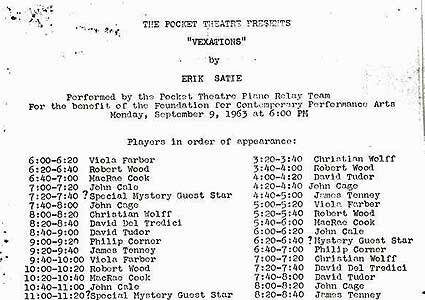 There is one person, however, who claims to have actually attended the Vexations concert with Warhol - the star of Sleep, John Giorno. In a panel discussion at the Museum of Modern Art in New York on 4 March 2011, Giorno claimed that he went to Vexations with Warhol and that after they left, Warhol returned to the concert on his own. During the same panel discussion Giorno said that on the back of the Vexations program was a biography of Satie which mentioned that Satie was a "Rosicrucianist" and that years later, during the Tate's event, Brendan Joseph told Giorno that he (Joseph) had watched the film over and over again and that it was based on a Rosicrucian formula. However, when I wrote to Giorno asking him to confirm that he had, indeed, attended the concert with Warhol, I didn't get a response and Giorno did not mention Vexations in accounts he gave of Sleep prior to the Tate's event in 2007. If Warhol did attend the concert, it is doubtful that he was there for very long as his presence would probably have been noted by one of the reviewers from the New York Times who attended the performance. (8) Each reviewer was given approximately a two hour time slot to review and none of them mentioned Warhol, despite the fact that the audience members were reviewed almost as much as the actual concert. Audience numbers ranged from about 7 to 40 so Warhol would have been hard to miss. One Times reviewer, Sam Zolotow, for instance, spent much of his "2 a.m. - 4 a.m. Tuesday" slot commenting on various people in the audience (which at that time numbered 20 people) but did not mention seeing Warhol. Warhol was more likely to have read the review of the concert than to have actually "sat through the whole thing" as he apparently told Plimpton. Click on image - The footage also appears here. Whether or not Warhol attended the concert, he denied that Cage had any influence on his own work in interviews. Warhol was asked about Cage's influence in several interviews including the often quoted 1963 interview by G.R. Swenson; (9) an interview for L.A. radio station KPFK in 1963; (10) and an interview conducted by Benjamin H.D. Buchloh in 1985. (11) During the KPFK radio interview both Sleep and the Vexations concert were referenced. The KPFK interview took place in Los Angeles when Warhol was visiting his second Pop exhibition at the Ferus Gallery which opened on September 30, 1963. The interview was conducted by Ruth Hirschman (later Ruth Seymour) and included both Andy Warhol and one of his "superstars" - the underground film actor Taylor Mead. At the time of the KPFK interview Warhol had already shot footage for Sleep in New York and the film had been mentioned by Jonas Mekas in the Village Voice newspaper. During the KPFK interview Hirschman asks Warhol whether he is going to have Sleep reviewed "the way the last Cage concert was, with all the reviewers going from 11 to 12." This is a reference to the Vexations concert. Warhol responds by saying that Jonas Mekas had already reviewed Sleep in the Village Voice. He does not make a connection between the actual editing of Sleep and the concert even though the interviewer has just referred to both. Hirschman's comment refers to a method of reviewing the film and not about the actual structure of the film. Hirschman: Is there a close tie-up in New York between Pop painting and filmmaking? Mead: ... are all very congenial. Hirschman: Tell me, does the scene include the theater, or is the theater in terms of this new movement finished? Mead: Yeah, the whole concept of repeating and repeating on the stage - well, no, there is a - 'cause it was mostly in dance, really, in music - in Happenings. Mead: It seems mostly to be only stage work that just happens one night. Mead: But shows that go on and on are just, the temperament of the people is just not too suited for it, I don't think. Because these are Beat people, really. Hirschman: Is there any tie-up between this and let's say Cage, John Cage's music? Warhol: Yeah, I think so. Hirschman: Do you feel that it has to be made cohesive? Mead: I think it's more fun to. It's more fun to have an hour concert than something that people wander in just to see - well, I don't know, it's fun both ways, but I'd like it, I like it, I'm very theatrical, I like a theatrical evening really, that fives you a great overall feeling that really charges you. Hirschman: Do you feel that you need a center? Mead: Well, with Cage or those other people you come in and maybe you're intellectually piqued, you know, but you aren't stirred emotionally and overwhelmed. Warhol: I would grant him, you know, a lot on purely experimental intellectual 'freeing the other artists' basis. Hirschman: But you don't feel that he's a romantic, do you? HIrschman: Andy, why do you repeat your images? Hirschman: When you come on to Andy that that way, he turns off. Like, there are lots of Campbell's soup cans. Is each one, to you, different? Hirschman: They're all the same? Hirschman: I went around counting at the Ferus which were selling, and I found out something interesting. I think you had trouble with one brand. The chicken soups were not going. I thought that was very curious. Mead: I think there are a lot of vegetarians out here. Hirschman:... things like that went right away. Warhol: No, I just think people do the same thing every day and that's what life is. Whatever you do is just the same thing. The structure of Satie's work, Vexations, was, of course, repetitive, and it's clear that in 1963 when Warhol shot Sleep, he was at least superficially aware of the use of repetition in music. As Branden W. Joseph points out in his essay, a quotation by Cage appeared under a photobooth portrait by Warhol of the composer La Monte Young in the June 1963 issue of Harper's Bazaar for a feature titled "New Faces, New Forces, New Names in the Arts.” In the quote, Cage refers to Young as being "able, whether by the repetition of a single sound or by holding a single sound for twenty minutes, to bring it about that what I had been thinking was the same thing, is not the same thing after all but full of variety." (15) Although Cage's linking the repetition of "a single sound" to "variety" differs from the reasons Warhol gives in the KPFK interview for employing repetition in his own works - "I just think people do the same thing every day and that's what life is. Whatever you do is just the same thing" - the "holding of a single sound" for a long period of time is not dissimilar to Warhol's technique of just turning the camera on and letting it roll. It's clear that musical repetition was in the air at the time that Warhol made Sleep, but whether the specific performance of Vexations had anything do with the repetitive structure of the film is still open to question. Warhol had been using repetition as an artistic technique for some time before 1963 so it is hardly surprising that he used it for his first major film. Whether or not Warhol met Cage when he (Warhol) was "fifteen or something like that" as Warhol 'guessed' when speaking to Buchloh, is open to question. However, he would have at least been exposed to Cage at the Outlines Gallery, as Pearlstein recalled attending such events at the gallery with Warhol. More reliable than the Swenson interview is what Henry Geldzahler wrote about Sleep. His comments appeared in an ad for the film in the January 16th issue of the Village Voice. Geldzahler writes, "As in Erik Satie’s Vexations when the same 20-second piece is repeated for eighteen hours, we find that the more that is eliminated the greater concentration is possible on the spare remaining essentials. The slightest variation becomes an event, something on which we can focus our attention. As less and less happens on the screen, we become satisfied with almost nothing and find the slightest shift in the body of the sleeper or the least movement of the camera interesting enough." But although Geldzahler makes an analogy with Sleep, no claim is made regarding the editing of it. The film had already been edited by the time that Geldzahler compared it to the Satie concert. It is likely that the Vexations performance, or the news of the Vexations performance, influenced Geldzahler's analogy but the analogy came after the editing of the film, not before. Repetition then, was very much in the air amongst avant-garde circles in New York when Warhol made Sleep. But whether Warhol decided to edit the film repetitively as a direct result of John Cage's production of Erik Satie's Vexations is still a matter of conjecture. It's possible, but it's equally possible that other cultural events, such as the Judson Church performances, played a part. Or it may simply have been that Warhol was extending to film the repetitive technique that he already employed in his art. There is little actual evidence to support the claim that Warhol edited Sleep in a repetitive manner as a result of the Vexations concert or that he even attended the concert in the first place. To mark the twentieth anniversary of his death in 1987, Andy Warhol’s (1928–87) first ever film, Sleep 1963, is screened throughout the night, accompanied by the legendary musical performance that inspired it. The five and a half-hour film will be looped to provide over eighteen hours of continuous viewing, and is a meditative study of the poet John Giorno asleep in his apartment. Warhol was inspired to complete the film with a new repetitive editing structure after attending the writer and composer John Cage’s (1912–92) historic 1963 performance at the Pocket Theatre in New York of the French composer Erik Satie’s (1866–1925) epic repetitive work for piano, Vexations, 1893. This transfixing event at Tate Modern brings together two artistic landmarks from a momentous year, and will be a contemplation on stillness, repetition, time and death. Cage was the first to stage a complete performance of Satie’s highly idiosyncratic work for solo piano, a 52-beat segment accompanied by the instructions that it be played ‘very softly and slowly’ 840 times. The piece was performed by ten relaying pianists each of whom played twenty minutes or fifteen repetitions of the segment at a time. The performance lasted 18 hours and 40 minutes. Andy Warhol claimed he attended the whole performance and that same year, decided on a new structure for Sleep based on the repetition of footage. The performers at Tate will include renowned new-music specialists including the composers Gavin Bryars and Michael Nyman, alongside the composer and scholar Joshua Rifkin, who participated in the performance in 1963, the acclaimed new music pianist Tania Chen, and some of the brightest young pianists in London. This landmark event is introduced by a special performance by John Giorno, the subject of the film, and accompanied by a panel discussion about the relationships between Warhol, Cage and Satie. Note: Although Warhol said he met Cage when he (Warhol) was "fifteen or something like that," exactly when he first met Cage is difficult to ascertain with certainty. Andy Warhol 365 Takes, written by the staff of the Andy Warhol Museum, refers to the Outlines gallery during Warhol's college years: "Warhol attended college from 1945 to 1949... Warhol worked hard at school and was a serious student of contemporary art. He made time to visit a local avant-garde art gallery called Outlines, where he was exposed to the work of such cutting-edge artists, architects, and musicians as John Cage, Buckminster Fuller, Marcel Duchamp, and Joseph Cornell." (p. 7) The gallery is also mentioned in Fred Lawrence Guiles, Loner at the Ball, The Life of Andy Warhol (London: Black Swan Books, 1990): "The Greenes [Balcomb and his wife, Gertrude]... had helped a local woman, Betty Rockwell Raphael, open a gallery called 'The Outline,' where every Sunday night during that fabulous summer of 1947 the avant-gardists... would convene for a cultural event." (p. 39) Balcomb Greene was one of Warhol's instructors at Carnegie Tech. 18. Matt Wrbican, Andy Warhol Museum, email July 30, 2009. 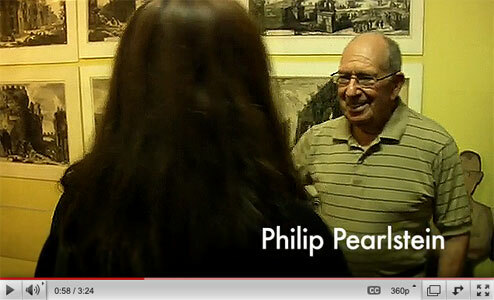 "This widely quoted interview is troublesome for art historians. Swenson and Warhol were good friends, but the artist was in one of his uncooperative moods, prompting the critic to conceal his tape recorder during the interview. Some of the more 'intellectual' quotes attributed to Warhol sound as if they may have been doctored by Swenson, particularly the remarks concerning the Hudson Review, a literary quarterly that Warhol was not known to read. Swenson's discussion with Warhol was one of eight interviews with as many artists published under the title 'What is Pop Art?' in the November 1963 and February 1964 issues of Art News. Seven of Swenson's eight interviews were reprinted in Pop Art Redefined by John Russell and Suzi Gablik (London: Thames and Hudson, 1969). Through careless editing, the last eight paragraphs of Swenson's interview with Tom Wesselmann, starting on page 118 with the question 'Is Pop Art a counter-revolution?,' are appended to Swenson's interview with Warhol. As a result of this production goof, several of Wesselmann's remarks are erroneously attributed to Warhol; these bogus 'Warhol' statements include his characterization of painting as 'audacious'; his claim that he got the subject matter from the fifteenth-century Flemish painter Hans Memling and his content and motivation from Willem de Kooning; and his avowed love for the paintings of Mondrian, Matisse, and Pollock." Because of the Pop Art Redefined catalogue, the phony Warhol quotes are continually perpetuated. Richard Morphet, for instance, began his essay in the catalogue to the 1971 Warhol exhibition at the Tate Gallery in London with a long epigraph that ostensibly cites Warhol; the words are actually Wesselmann's. Art historian Thomas Crow also tripped up on the false Warhol quotes in an otherwise excellent article, 'Saturday Disasters: Trace and Reference in Early Warhol,' Art in America, May 1987, pp. 128 - 36. Crow had the good sense to note parenthetically that Warhol was capable of 'an inscrutable allusion to Memling as one of his sources.' Warhol, indeed, would have been unable to distinguish a Memling from a lemming."